The Blackfoot Indians in the prairies passed on their history and collective memory through storytelling and in pictographs. 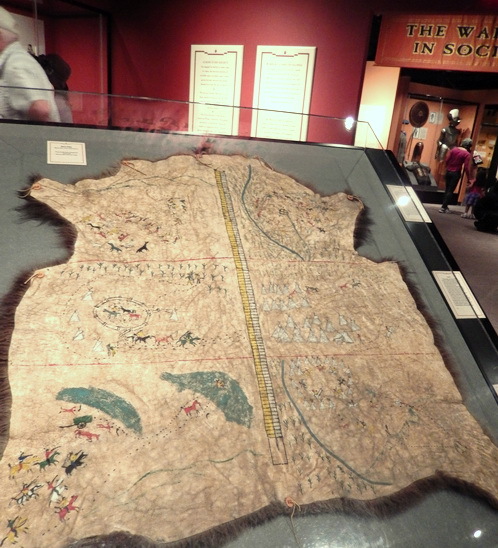 Painted images on tanned buffalo leather hide are called story robes. 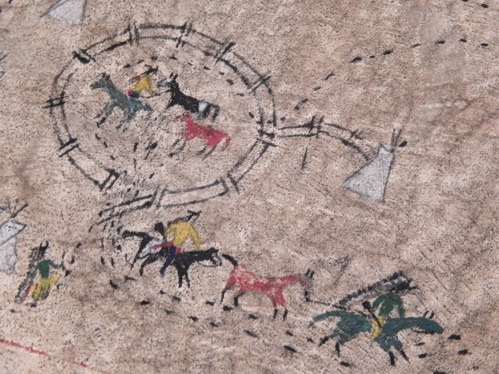 Occasionally they painted stories on tipi covers, blankets and rocks too. Blogging is our 21st century painting and wearing our story robe. When I began blogging, it was about living in an Olympic city, 2010 Winter Olympics in Vancouver BC. My blog wove in observations and snapshots from my bike saddle. inspired by insights, on my sweat, nutritional intake, timing and hill ascents? I doubt such boring repetitive verbiage would lasso back any reader, months from now. I did the hill or I didn’t do that hill. Move on. 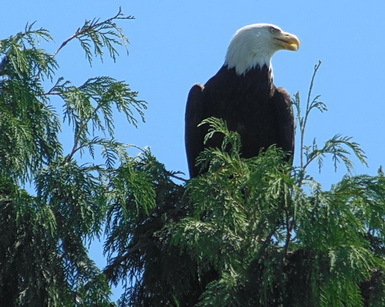 Magnificent bald eagle spotted high up in cedar tree during a bike ride. District of West Vancouver 2013. Photo by J. Becker. Hopefully what I see is of greater value to others, not my cycling performance. my career and profession. I am formally trained and career-wise, a librarian and information professional. A lot of us library folks initially blogged to show for work-related reasons, we could master this relatively simple skill. A lot of my colleagues latched onto it earlier than I did. 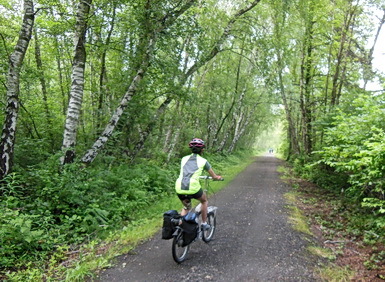 Cycle Write Blog to me, captures the synergy of cycling and writing where one feeds the other. Cycling is just a wonderful, convenient narrative thread for me to knit together my stories for my robe, on only a small part of my life journey. As you can see, those stories aren’t exclusively about cycling at all –art, food, culture, history and travel. 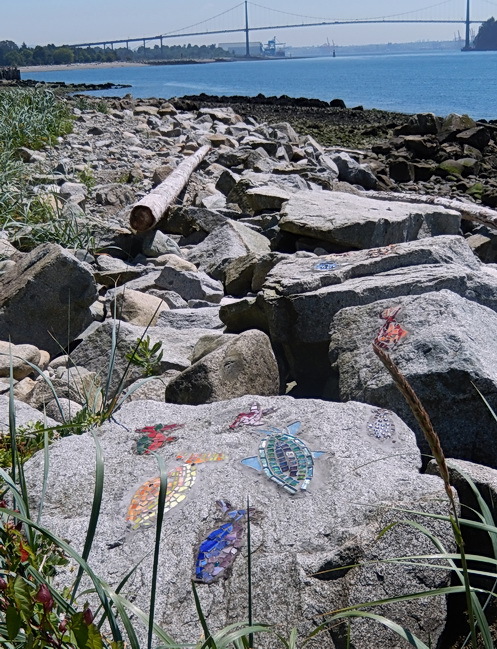 Fish mosaics embedded in rocks by beach along the Pacific Spirit bike path in West Vancouver. 2013. Photo by J.Chong. Lion’s Gate Bridge in background. Art – a lifelong interest since I was a kid. I packed in art courses galore in school. However, I never took any art courses at university. Didn’t think it would earn me a living no matter how talented I was. Then when I started working full-time, I ended up being an evening art course dilettante and art dabbler. I have massive stock of art supplies I’m still trying to wade through. My art play occasionally pops up on Cycle Write. Even my family members see some of my art for the first time –on this blog. I live several thousand km. apart from them. I also enjoy art galleries and all art forms. Food – an all favourite subject world uniter. We all need food. Therefore, we all have opinions. It’s not a starring topic for my blog. I just latch onto what I think, are lesser known food dishes or showcase an ingredient not familiar in mainstream North America. No, I don’t offer heirloom recipes because I’m lazy. That means I have to test ingredient proportions properly. Ok, I might. If you ask nicely. 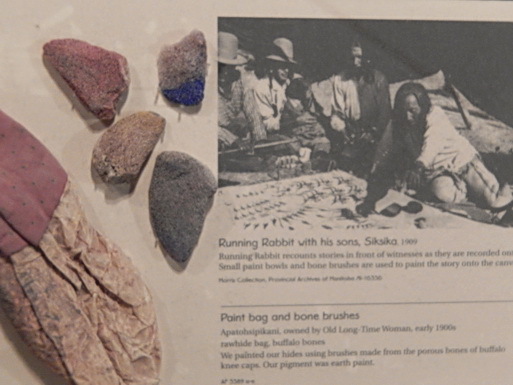 Painting bag and painting stones that served as brushes for painting a Sikiska story robe. Glenbow Museum, Calgary AB. 2013. My father. 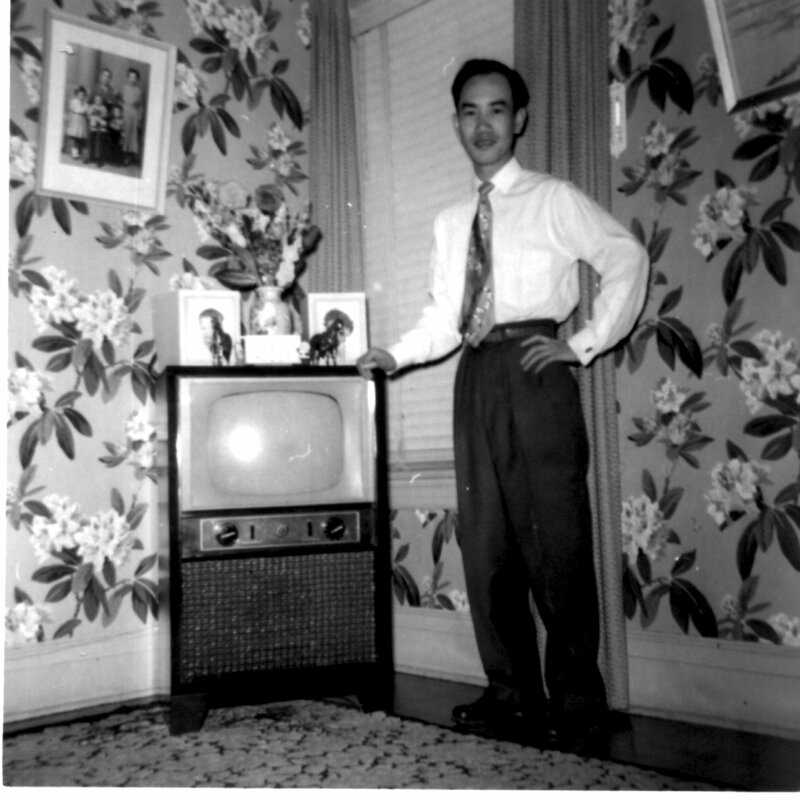 Unknowingly he immigrated to Canada, just 3 years after the Parliament of Canada granted Chinese-Canadians the right to vote in 1948. Photo taken in southern Ontario, approx. early 1950’s, in his early 20’s. collection of books, both non-fiction and novels in this area. You cannot plan your future a lot better if you don’t know where you are now and how you got there in the first place. Culture – See history. It’s all fused along with food, art too. Cycling – Yes, I’ve done a lot of cycling. But I’m not a racer nor randonneur. Some years I did rack up 7,000 km. annually. Recently it’s under 2,500 km. so far this year. I’m way past beating up myself. I’m just happy to bike daily. That’s good enough for me. I just bike for transportation, fitness, health and fun. Yes, there’s all sorts of cycling culture. No, I don’t have a fixie bike. I’ve never had a bike with dropped down handlebars and don’t plan to get one. No, I don’t plan on cycling in high heels. That doesn’t sound safe to me. Ornate church paintings considered as “written” (for Eastern Orthodox Christian Church) because for centuries, they depicted biblical stories for illiterate Christians. St. Vladimir’s Church. Calgary AB 2013. Photo by J. Chong. Alberta has several well preserved churches across the province to serve its large Ukranian community. Travel – It’s all fused with all of the above topics. Sometimes you’re not sure if I’m actually living or visiting a city. Great, ’cause you can be a tourist in your own home city too. Suffice to say, that I write as a Canadian who’s lived in Canada all her life. Brilliant fall colours and mountain cliffs near Sante Fe, New Mexico. Oil painting 2006. By J. Chong. This area inspired painter, Georgia O’Keefe, who lived on her farm, that she named Ghost Ranch. So I wear these prime subjects on my story robe. The story ink is already embedded into my garb. Unlike war stories that might be found on certain story robes, my blog robe doesn’t have much ranting. It just takes a lot of energy for me to rant …to a bunch of strangers. I’d rather rant and get useful feedback from friends and family who know me well. After all, a blog is just like a story blanket with limited space. There’s only a slice of time for me to blog for you. Chong, J. Blogging and Cycling: It’s Like a Drug. Guest blog post in One Cool Site on Blogging Tips, Nov. 21, 2011. * Observations at different jobs: A well known Canadian, construction site culture. Witnessed celebratory entrance of this Canadian wheelchair athlete at the end of his worldwide tour to raise awareness for spinal cord injury. He visited our organization, a rehabilation hospital for adults with spinal cord injuries. Canadian Broadcasting Corporation. Finally Getting the Right to Vote. Includes a very short videoclip on the Chinese Canadians soldiers and nurses who served overseas during WW II for Canada which galvanized effort to change federal law. Previously even a person of Chinese ancestry, born in Canada, could not vote. Great metaphors in this post. I had never heard of story robes, but you are right–they sound a lot like blogs. And I love the correlation between biking and writing. I wrote a post once that was Freshly Pressed that compared blogging to the front porch culture of decades ago, and I once did a post called something like “Why I Pedal WordPress Bloggers: My Life in Bikes.” Hope you have a lovely Sunday. Didn’t know you had done a guest post for timethief. Going to check that one out. Love the new look, by the way. Jean this is beautifully written. I enjoyed the metaphors very much. Looking forward to reading future posts of your varied interests. Fantastic Jean. I really enjoyed it! Jean, love this post! I am drawn to stories. Whether they’re told orally, with pictures, or the written word. It is our stories, woven into each others’ stories over time that tell the story of humanity. Absolutely Diana, the fabric of our stories often are inextricably made of threads of interactions with other people. I know that you have many stories to offer up at your end. so do you Jean – I love your stories and adventures! So many stories in one life! And your Dad is so thin! I appreciate how you stitch the parts of your life together, food, art, cycling, environmental concerns. Gives me hope for the world. A little anyway. I’m sure you have way more stories too, jbw. I suspect my father now is the same weight @85 yrs. Meaning he’s lost weight back to the time of his entry into Canada. Right now he’s 98 lbs. : he has prostate cancer. So a loss of nearly 8 lbs or so over the past few years. Living in Alberta where the economy is highly dependent on oil, gas and agriculture, environmental concerns should be at the top of politicians’ priorities. But the industries such as oil tar sands rule over a lot of protests. Very different in British Columbia where most citizens want to block the oil pipeline from Alberta. I just bike. Loved the “ado” part. Well, you seem like you are so many things, so well rounded, then you definitely have nothing to worry about. Just mix it all up, ’cause I do agree about not having a monotonous pattern for posting. But you know what in the end, like I always suggest, “blog the way you are”. I only did it once, cycling and taking pictures of the things I see. It’s about time that I do that again as it has been awhile. This post is fabulous. As I lived on the prairies for many years I was aware of story blankets so the your title thrilled me. I love the way you wove in the metaphors here and your stories. I remain your biggest fan. Thanks for your supportive visits and comments, titi. Actually before I lived in the prairies, I never learned about the story robes/blankets. My education didn’t go deep enough.. but so many stories to live, to tell and little time. Dear Jean, this is a creative and warm-feeling post. 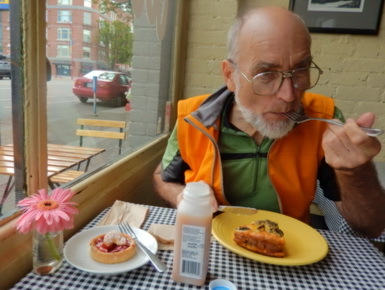 I like the metaphors you use and I like your down-to-earth blog “personality.” I too enjoy cycling, stories, food, travel and for some reason it is easy for me to become seduced by visions of grandeur of becoming a grand randonneur, owning several vintage bikes, etc. etc. etc. Keeping it real here, thanks. I love your blog logo of birdie with chef hat on bike. 🙂 Your drop-by and observations as new visitor is most appreciated. So you own several bikes too? None of mine are elegant vintage, but each has story. I just love your blog and your writing because it is so diverse and I like the way you write, simply yet beautifully. I enjoy reading about your cycling adventure and I love how you show scenery and provide background to the places where you go. Love the new look of your blog by the way! I think you should put a link to this post in your about page too. It’s a great suggestion Rita, once I get more time on this blog for the about page. Thx for the compliments but I’m still trying to find ways of simplifying my writing even more. Hope my blog keeps you in touch with a part of Canada which is different from Montreal, but it’s still Canada –even if cold, snowy right now. I love the story blanket. Once when I was in Arizona, my Dad showed me a huge mosaic – about 18-foot high – just off a trail. As I recall there were cows nearby. I often wondered who painted it and why they chose that location in the middle of nowhere. My stories also veer into several different directions. That’s just the way my mind works and I love the diversity you show on your blog. Thanks for visiting and commenting on mine. Perhaps that isolated rural area had some history from long ago, Judy. Thanks for dropping by and hope to see you from time to time, earthrider. Thanks for the link which I will pass to my partner since it appears some of those themes are only for self-hosted wordpress.org blogs. Yup, wondering about another theme. It’s a matter of finding time to change and do the detailed adjustments. We’ll see.. I just wrestled with the monitor the past 45 min augh. The day spread dark before me – I thought I would not have access to my blog all day and wouldn’t be able to contact you. Anyway, here I am! You’ll get your link back on the post today. =) Funny you say that: Writing parts 1-3 for the Race was the first time I talked of myself, where I come from, and Korean-Americans bc I didn’t consider any of that important enough on my blog. Didn’t want to take up readers’ time (my mantra). And I went through with it only to jump-start the series and model it for the contributors. Interestingly, the feedback on my story as well as the series has given me license – and a bud of a desire – to share more from a personal angle. Not to talk about myself but bc I see it does what I’ve said successful blogging does: hold up a mirror for people to see and think about their own past (even for the differences that stand out). You’re well set on your way to loyal audience. Looks sizable too. I’m semi-slack. There are methods which I’m not using –Twitter, Facebook. Ach, blogging is enough for me. As for my personal/family history, I don’t see it as any more captivating than other 2nd generation Asian-North Americans. I dunno. I don’t FB or Tweet, as is obvious from the looks of my sidebar. No time. No interest. And yep, that’s how I felt about my Kor-Amer story. My thoughts on this blog post?? Lovely, lyrical, thoughtful, and compelling are words that come to mind, Jean. Also: exceptionally fine. I was not familiar with story robes. How interesting to view blogging as a kind of modern-day version of same. It fits. Your photos, as always, enhance and illuminate your words. Many a blogger could take a lesson from you on that score– a lovely and harmonious balance between word and image. 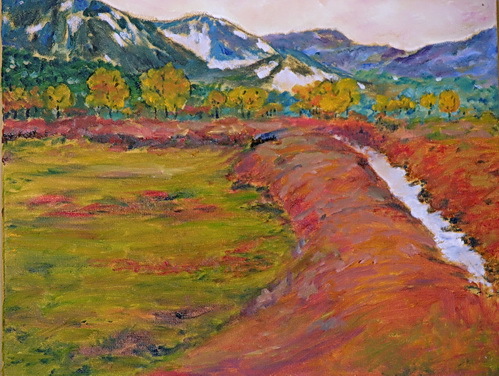 Loved your oil painting of the rugged terrain near Santa Fe (always great to see any of your paintings), and you framed those church interiors beautifully. Also loved the photo of your dad– very poignant and affecting. I was sorry to read that he has prostate cancer, I shall say a prayer for him. My own dad will turn 90 in July, and has dementia. Life is such a glorious mystery, and that B&W photo seemed to capture some of it. Great post, thanks for sharing, I feel we’re all richer for your reflections. Thank you for your thoughts, Mark. It’s been awhile since your happy visits have graced this blog. Your comments and musings are always welcome here. I’m sorry that your father is not well. He has lived a long life and probably rich in experience. It’s been awhile since I’ve painted. It occurred to me that I’m lacking space for storing my art supplies and paintings. So I’ll have to start giving them away over time to loved ones. This is a really cool way to look at blogging and at your life. I hadn’t heard of story robes before either, and I’ll have to check them out. Wouldn’t be surprising story robes will resurface. But maybe we’ll be wearing robes of electronic images and words from our blogs. Lovely. Thank you for the link. I, for one am rather glad that you blog about a variety of topics because you have so much to add to them. Great post. 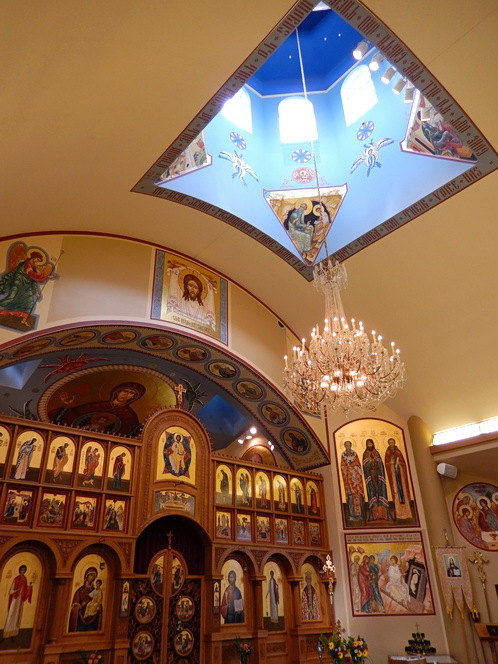 To me it was interesting to see inside of an Orthodox church. In Finland we have some and they gorgeous. I am art lover and that is why blog contains many art posts. 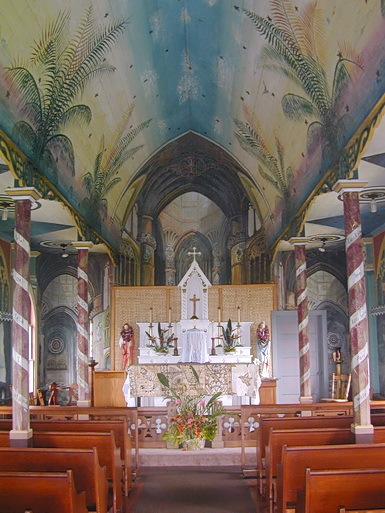 My interest is to see inside churches world-wide –to see local art and cultural influences. The Ukranian Church featured in my city, is quite elaborate inside which is unusual for churches in our city. We share some similar blogging interests. Later, next year I will be releasing a blog post about Sagrada Familia later to give my impressions. There are others more pressing in the publishing line-up. I will read Your Sagrada Famila post then. We tried to visit it, but too much people. Now You mat surprise when I say that in Finland we have gorgeous churches. On countryside, they are old wooden churches and what is the best is that bell towers are separated from main building! They are full of beautiful art, like beautiful altars, chandeliers, church art, Votive ships and pulpits. On nearby these churches there are graveyards there are gorgeous WWII memorials, many of them touching sculptures. This is not all, because in Finland we have so called Poor Man statues, which are unique in the whole world. In Sweden, there are only nine and we have 145 in active use. Those old wooden gorgeous Poor-man statues are situated mainly on the area call Ostrobothnia. The area is easy for biking. I have photographed about 440 churches around Finland and mainly on our countryside. I give here some links that You better understand our heritage and the worth our unique churches. Beautiful bell towers in Finland. Statues of Paupers1 (Poor-Man statues). I have presented three Orthodox churches and the can be found under Categories. Click select categories to find them. Churches-Orthodox. Well, what about biking holiday in Finland on the Ostrobothnia area or driving around the area by hired car? Our churches are open for visitors mainly from the second week of June up to the second week of August. Enjoy these, but they take Your time to study them. When seeing these You have tiny idea about what Finland offers. Best regards. Matti.